It’s the perfect time of the year to enjoy some nutritious almonds. It’s the holiday season and a great opportunity to incorporate more healthy nuts into your diet. 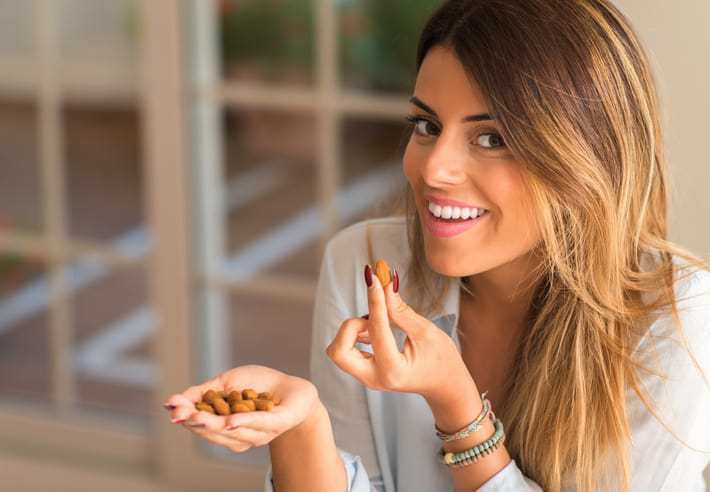 One of your healthiest nut choices is delicious and nutritious almonds. Almonds are filled with healthy fats your body loves. They also are loaded with vitamins, minerals, and antioxidants. Vitamin E. Almonds are a great source of vitamin E. There are tons of health benefits in vitamin E. Vitamin E is a powerful antioxidant that is critical for our bodies, and may help prevent cardiovascular disease. Antioxidants. Antioxidants help neutralize free radicals before they can cause damage to our cells. They also help to slow the cell oxidation process that affects aging and disease. Magnesium. Almonds are loaded with the mineral magnesium which affects more than 300 bodily activities. Reduce hunger. Studies show eating almonds are satiating, reduce hunger and lower calorie intake. Lowers LDL cholesterol. Eating nutritious almonds regularly has shown to reduce bad, LDL cholesterol. High cholesterol can lead to heart disease. Blood pressure. Almonds may help lower blood pressure levels. High blood pressure can lead to strokes, heart disease, and kidney failure.